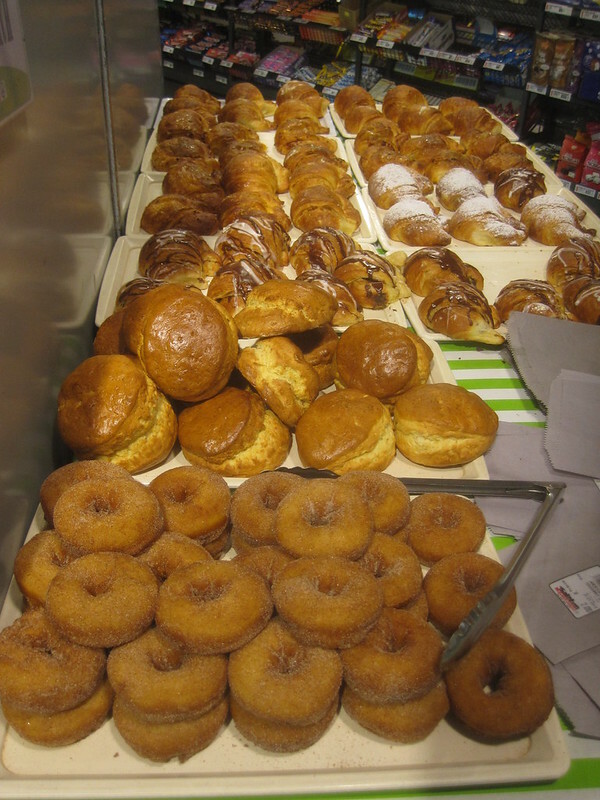 While I was in Cape Town I visited the local Spar Quick Shop for a couple of American Donuts every morning. The two donuts set me back about fifty cents. I really liked them. The hostel where I was staying offered breakfast, but it did not come free with my bed as it does in some locations. Plus, breakfast wasn’t served until 7:30 in the mornings. I was usually up and into the local 24-hour McDonald’s for coffee by 6:00 and I would pick up a couple of fresh donuts between the hostel and the McDonald’s. This entry was posted in Travel and tagged Africa, Cape Town, Overland Trip on August 8, 2012 by Steve. They are south African Penguins and they are really cool. 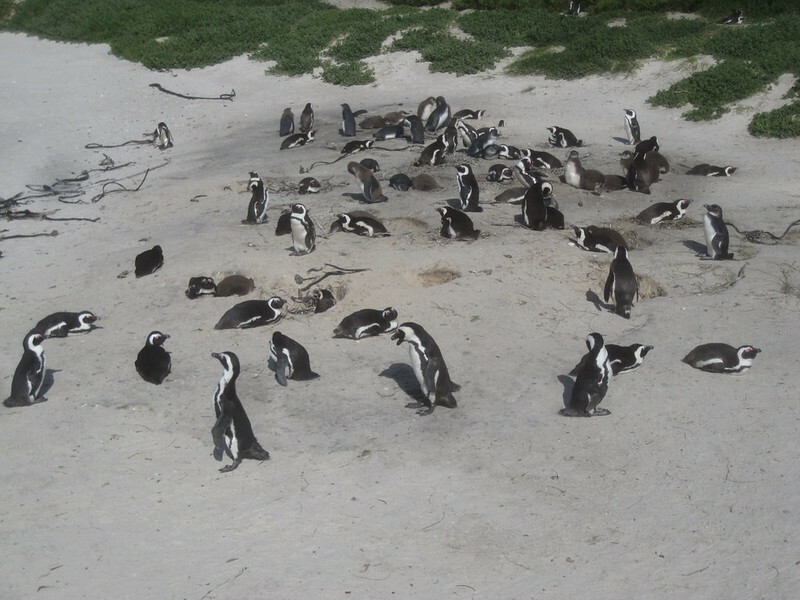 I went to see them at the Boulders Penguin Reserve in Simon’s Town. Actually, I think all penguins are cool. If I had a choice of animals to watch for extended periods of time, the penguin would be at the top of my list. I like to watch them walk. I like to watch them stumble. They are so ungraceful. They are just so much fun to watch. I like to watch them interact. They have so much personality. I took a lot of video of the little creatures. The only thing missing was a bench at the penguin reserve to let me sit and watch them for a while. This entry was posted in Travel and tagged Africa, Overland Trip on August 8, 2012 by Steve. 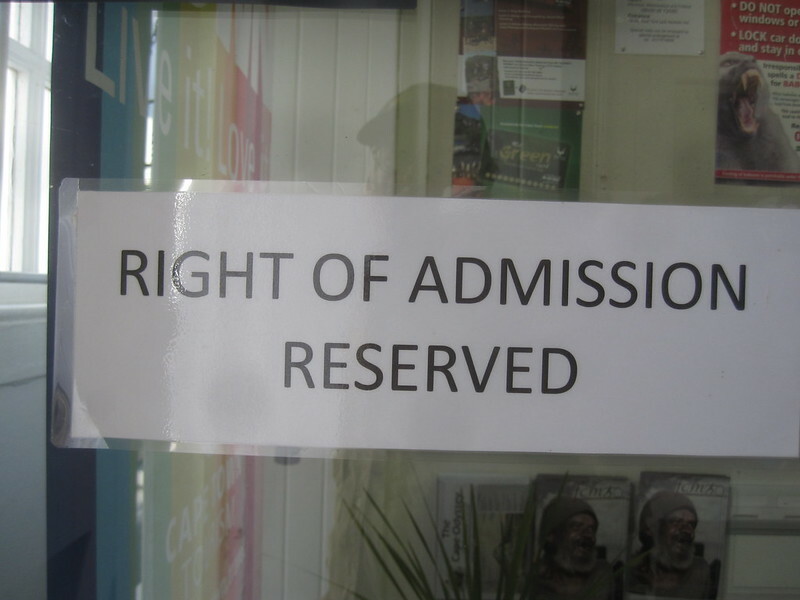 Note that this was not the best picture of the Right of Admission sign that I could have found. Unfortunately, when I had a good sign in front of me I always seemed to forget to take a picture of it. It seemed that all private businesses had one of these signs on the door or window of their establishment. 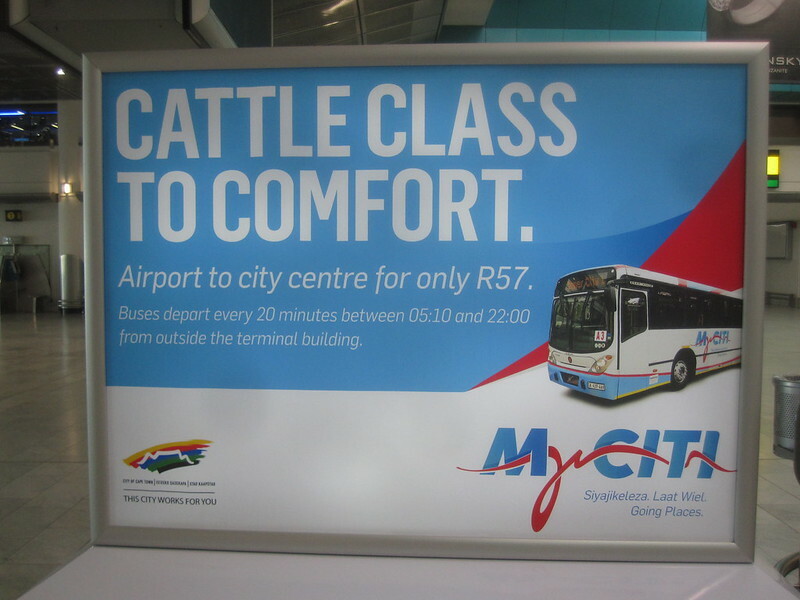 South Africa still has remnants of the apartheid era in place throughout the country. Some of them obvious, some of them less so. I’m in Cape Town and I had been told by some people that it was a good day trip to Simon’s Town. 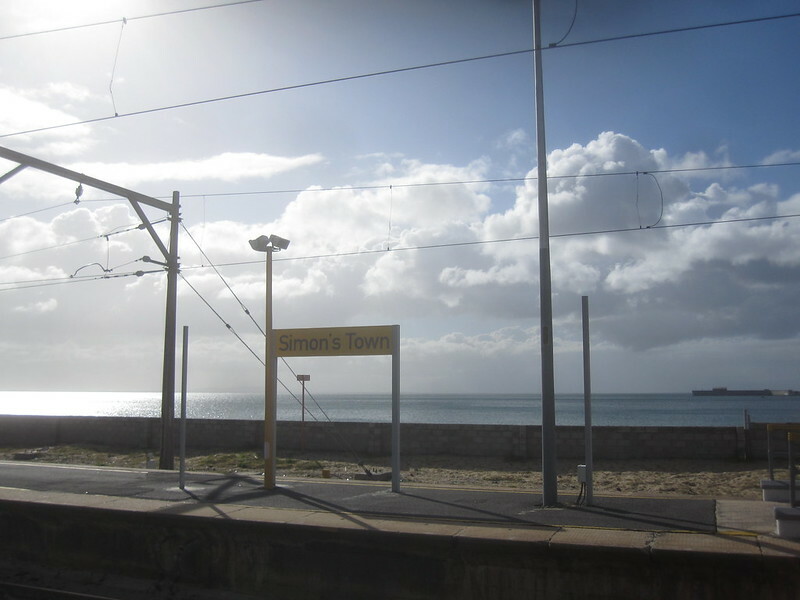 I went to the train station and found that a round-trip first class ticket to Simon’s Town would set me back less than $5. I thought that sounded pretty fair so I took the train. I made sure and get a first class ticket which cost me twice as much as a second-class ticket. The reason why was that I was told that there was much more petty crime in second class as first class and only really, really poor people took second-class train rides. Sounded like hog-wash, but who am I to question local wisdom? It seems that South Africa is much like the United States. People with money tended to use their own autos when they wanted to go somewhere reasonably close. I went out expecting to eat some fish ‘n chips from the local fish ‘n chips store but it had closed by the time I got there. I was disappointed. 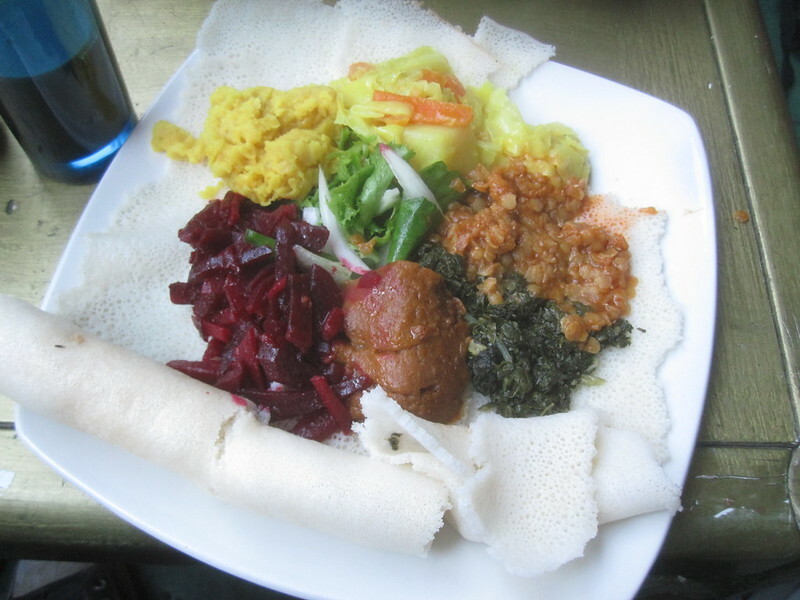 But I was on a street that had dozens of restaurants that were open and all I had to do was to do a little walking until I found the one I wanted. So I did. I wound up going into the Food Inn, which I surmised to be an Indian Restaurant once I got inside because of the menu and the fact that almost all the employees appeared to be of Indian descent. 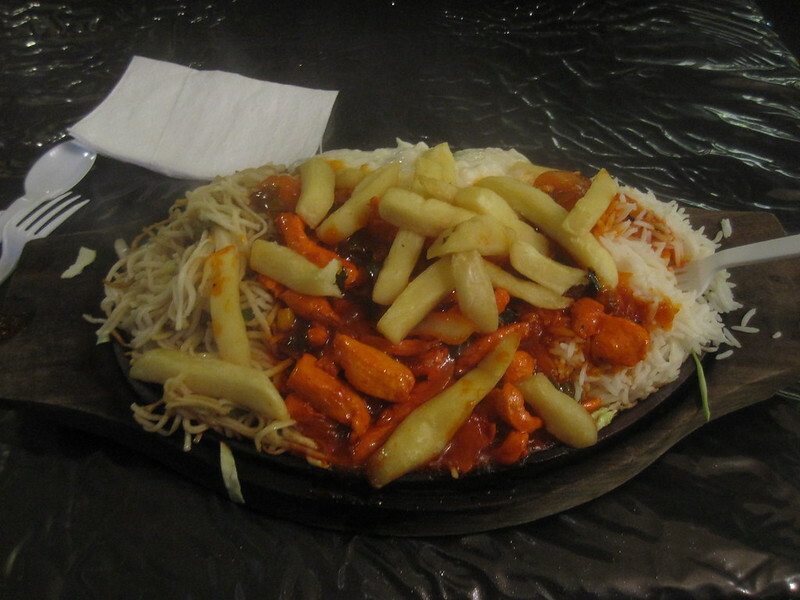 I ordered the Chicken Sizzler, which looked good in the picture on the menu. When it arrived it was sizzling. Really, really sizzling. It took almost 10 minutes for it to cool down enough so that I could eat it. They must have had the plate in a hot oven or something. Was it good? It was great. Plus, there was enough of it left over so that I could have the rest for breakfast in the morning. This entry was posted in Travel and tagged Africa, Cape Town, Food, Overland Trip on July 31, 2012 by Steve. It’s the Ferris wheel at the Waterfront. 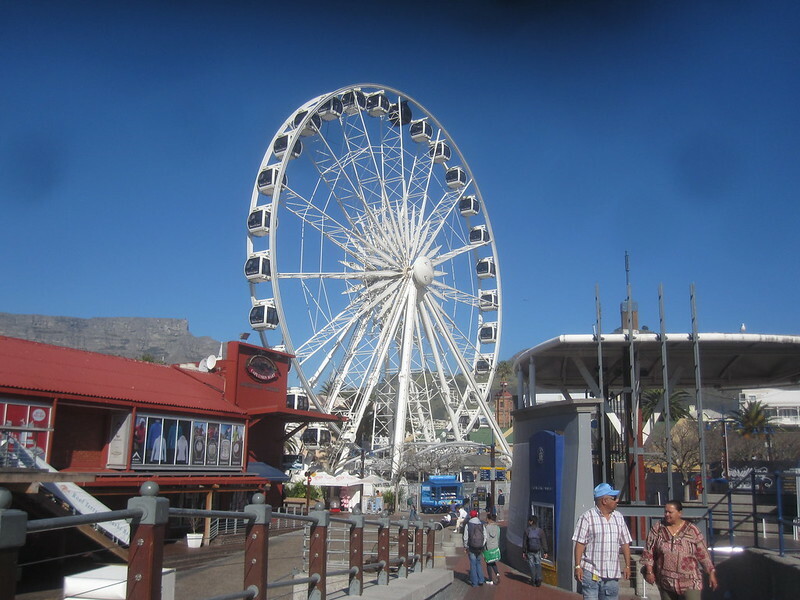 According to Wikipedia &quot;The Victoria &amp; Alfred Waterfront in the historic heart of Cape Town’s working harbor is South Africa’s most-visited destination, having the highest rate of foreign tourists of any attraction in the country.&quot; I didn’t know it was that popular. I went there to book a trip to Robbens Island. What I saw was a very large shopping area and lots of lots of entertainment. The technical term for the Ferris wheel is the Observation Wheel. I didn’t ride it. I spent time checking out the really nice mall and looking at all the interesting things to do at the Waterfront. This entry was posted in Travel and tagged Africa, Cape Town, Overland Trip on July 31, 2012 by Steve. 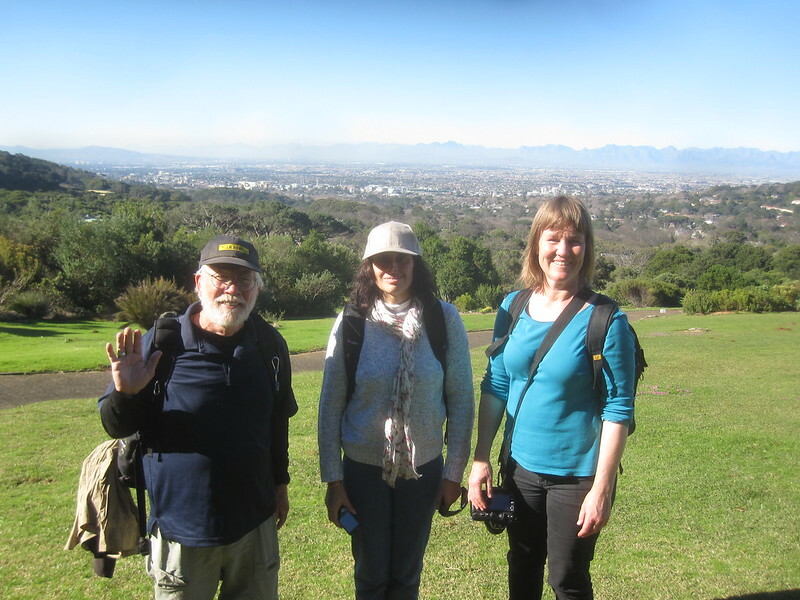 After Carmen, Stina, and myself visited the Kirstenbosch Botanical Gardens we went back to Cape Town to find a restaurant for dinner. As we walked down the street Stina decided to enter the Timbuktu Restaurant. I’m not sure why she picked this restaurant. There was no menu outside and she could not see the restaurant as it was on the second floor of a large building. When we arrived at the restaurant they seated us on a very large balcony overlooking Long Street, one of the most active streets in downtown Cape Town. The balcony was decorated very… eclectically. The whole ritual of eating there was… different. I had the combo veggie plate. It was… delicious in an odd sort of way. It was a very unique experience. If you’re in Cape Town and want a different sort of place to eat, try it. The restaurant is across from the Purple Turtle, which is a hard to miss on Long Street. 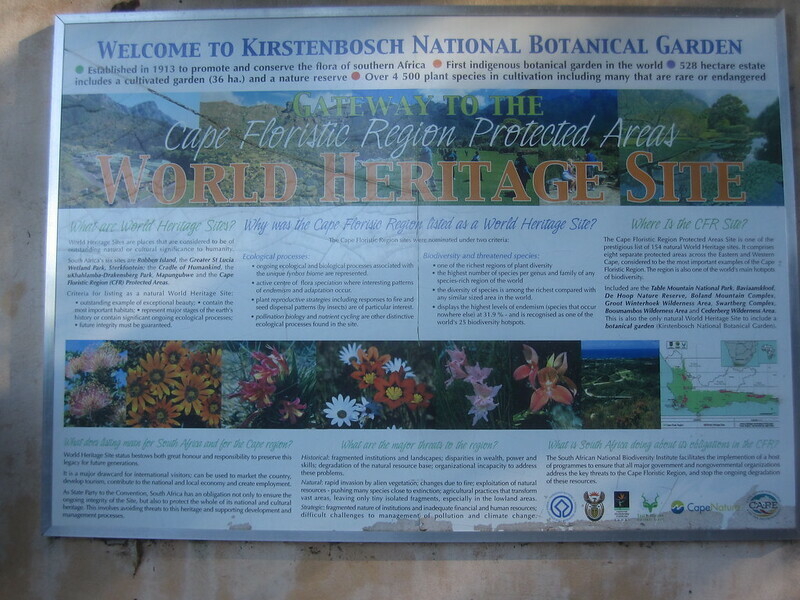 Kirstenbosch is a botanical garden which is said to be the best in Africa. Travel and Leisure magazine rates it the #2 botanical garden in the world. The traveldk.com web site rates them at #4. The gardens are a UNESCO World Heritage site. I visited the garden and came away quite impressed. They were huge and they had to be as good as any botanical gardens I have ever been in. CS means Couch Surfing. The people in the picture are me (left), Stina (right) who is from Sweden and had an apartment in Cape Town, and Carmen who is from Uruguay and is staying with Stina for a few days while she is in Cape Town. We got together for lunch one day and the next day decided to spend the day at the Kirstenbosch Botanical Gardens. It was a marvelously beautiful day and we had a great time there. It’s really nice to make new friends. I try to cultivate new friends through CS whenever I get the chance. It’s a project I believe in.